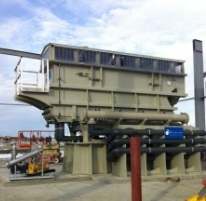 World Water Works, Inc. announces the availability of its new www/RESOURCE DAF, a next generation dissolved air flotation (DAF) system that handles flows from 5,000 to 8,000 gallons per minute (gpm) and is ideal for industries ranging from food processing, to desalination pretreatment, to textiles, to petroleum, and beyond. Pilot treatment plants are available and thorough bench testing and pilot treatability studies are conducted to guarantee results. With a high total dissolved solids (TDS) and saltwater tolerance, www/RESOURCE DAF provides the flexibility to outperform traditional DAFs and ensure longevity. Heavy duty durable polypropylene construction allows operation over a wide temperature range and pH range of 2-13, so the system offers tremendous treatment flexibility. The system’s design guarantees low operational and maintenance costs. Consistent and reliable performance ensures compliance with government regulations. The www/RESOURCE DAF system uses DAG (Dissolved Air Generator) technology, which allows the removal of fine insoluble materials by generating 5-12 micron bubbles, the finest in the industry. The DAG system achieves saturation efficiencies that approach 100 percent at low energy consumption. This performance has been documented through upgrades of existing systems that show the new DAG technology improves performance while reducing energy costs by more than 50 percent.